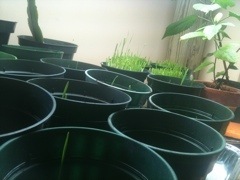 The process of learning about Wheatgrass and how to grow it has been long, slow and beautiful. My first exposure to Wheatgrass juice was back in 2002 when there was a cafe in the urban area where I lived that carried it. I quickly learned to love it. Growing it myself has been a much more personal way to enjoy it, I have easier access to it and it’s brought some powerful life energy into my home over the quiet months. I grow my sprouts under lights, but they can grow in any sunny window. I use a 1:10 apple cider vinegar: water mixture to control the fluffy, harmless mildew spores that occasionally appear. My reference book has been, “The Wheatgrass Book,” by Ann Wigmore. 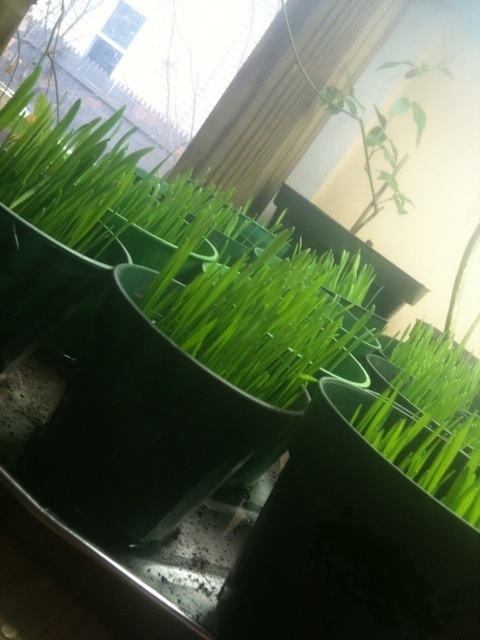 Wheatgrass is often referred to as, “liquid sunshine,” and my family has certainly benefited from it’s prescence in our home. We have more energy, our skin is more radiant, blood pressure is lower and (Praise Grace) no one’s been sick all year.